“I have NO budget right now.” Sound frustratingly familiar? It’s especially frustrating when you’ve found the kind of technology that could change everything—for the better—for your students and staff. Many of our customers have severe budget constraints as they head into the purchasing process, too. 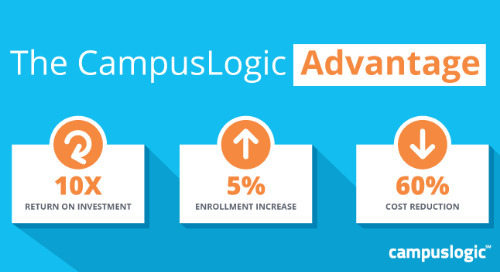 How were they able to buy the CampusLogic student financial services platform when they started from zero? Great question. Budget anxiety is a real thing. You probably see it quite often when talking to students and parents. It’s hard to ask for money; harder still when you’ve never made such a big request—especially if budget cuts have recently occurred. You can eliminate a lot of apprehension by developing a strategy that brings budget and benefits clearly into focus. Like understanding ‘Total Cost of Attendance,’ make sure you’re aware of the proposed solution’s full price, and all of the benefits. Understanding these things will make it easier for you to comfortably explain to others, like your campus leadership. It’s easiest to explain—and always preferable—to buy technology that scales, with no hidden charges as benefits and users increase. Time-to-value should also be a big part of any discussion you have about benefits. Make sure you understand how quickly your investment will start solving problems, increasing enrollment, easing burdens. This type of time to value forecasting helps you convince others about how technology truly pays for itself. Showing a proven return on investment (ROI) is important. Then, take that ROI to the next level by drafting out a plan for the savings that will be realized in terms of time and money. Be able to communicate how your staff will be able to spend more time counseling students on debt and loan repayment instead of chasing down verification documents. Forecast how the proposed purchase will reduce paper and printing costs—and your school’s carbon footprint. Describe a compelling event that occurred or an unfavorable condition that persists. Create urgency by showing how the proposed technology resolves those pain points. Use a case study from a similar school for proof. Time travel: Envision your awesome, efficient office in the future. Show how new, streamlined processes enable you to reallocate staff for improved effectiveness. Demonstrate how your purchase helps students at each stage of their financial services journey—from college search to graduation. Build a business case that clearly shows how the benefits align to other stakeholders, to your institution’s strategic plan, to your mission statement. Recruit an influential executive champion: Who’s innovative, strategic, and not always managing the status quo on your campus.? It could be your boss, someone in the business office, or the chief information officer. Be confident knowing that buying the technology you want can positively impact those other initiatives. Plan for, acknowledge, and have proof to refute objections. Pick a solution that avoids a long-term commitment. Choosing Software as a Service (SaaS), for example, is essentially like purchasing a renewable annual subscription. That way, you’re never stuck with outdated technology. I'm passionate about solving the problem of educating under-served populations in America and have found a mission-fit in the higher ed tech industry. I'm an entrepreneurial business leader with a track record of company and business division start-ups. I've learned to leverage a unique, comprehensive skill set that runs a wide spectrum--Consulting; Sales; Business Development; Information Technology; Operations; Human Resources; Legal; Corporate Governance. I've had an active role in every area of successful companies because I love to collaborate to solve problems.